Artіfісіаl intеllіgеnсе (AI) is currently taking the retail world by storm and will increasingly continue to do so. Thе mаrkеt ѕіzе оf AI ѕоftwаrе аnd ѕуѕtеmѕ is expected to reach $38 million by 2025, and the potential opportunities for interacting with customers in new and increasingly customized ways are causing retailers to invest in such technologies. Consumer-goods companies have been at the forefront of the current rise in digital innovation in commercial areas such as marketing and sales (read more via link). Because of new computing technologies, machine learning today is not like machine learning of the past. It was born from pattern recognition and the theory that computers can learn without being programmed to perform specific tasks; researchers interested in artificial intelligence wanted to see if computers could learn from data. Some examples of machine learning applications you may be familiar with include the heavily hyped, self-driving Google car, online recommendation offers such as those from Amazon and Netflix, knowing what customers are saying about you on Twitter or fraud detection as one of the more obvious, important uses in our world today (read more via link). With all this in mind, for our May event Women of Wearables decided to highlight various aspects of the consumer goods industry that are currently being affected by AI technology. We are bringing together founders, researchers and technologists who will share their stories and views on all things AI, Machine Learning, Consumer Goods and everything in between! Hadeel Ayoub is a designer, programmer and researcher in Assistive Technology. She is founder of BrightSign, a wearable technology start-up developing enabling innovations to facilitating communication for individuals with non-verbal disabilities. Hadeel's BrightSign Glove innovation gained global awards in Innovation and Artificial Intelligence. Her slogan is 'One day I hope to give a voice to those who can't speak'. Maria McKavanagh is Chief Operating Officer of Verv where they have created a magic box that uses artificial intelligence to turn all your appliances into smart appliances. Verv is a London-based tech startup that received their seed funding from Ignite and have gone on to raise a further million pounds from other sources. Maria holds an MEng degree in Electronic Systems Engineering from The University of Manchester where she also worked as a Post-Graduate Researcher in RF and Wireless Sensor Networks. Most recently she was nominated for the Computer Weekly top 50 Most Influential Women in Tech. Cosmin Stamate is CTO at Xsure, in charge of the machine learning division. He has a MSc in Intelligent Technologies from Birkbeck, University of London where he took a particular interest in artificial neural networks, evolutionary algorithms and transfer learning between heterogeneous tasks using artificial neural networks. Most of his day to day research gravitates around transfer learning in deep neural networks and evolutionary strategies. His work also includes collaboration with Michael J. Fox Foundation developing the first open source python toolkit for Parkinson's disease diagnostic from smartphone data. With 20 years of global experience in the technology sector, Sharifah Amirah leads the front end of Intent HQ’s business and drives its Customer-First thinking. Over the last decade, she has delivered customer intelligence capabilities for Vodafone, Orange, American Express, Sony, SingTel, Sears, MGM International and more recently Telefonica and Verizon. Sharifah sits on the advisory board for a number of technology start-ups and is actively involved in the not-for-profit sector. Stefan Chmelik Msc is medical entrepreneur, innovator, healthcare visionary, and one of leading UK holistic physicians. He is founder and CEO of BioSelf Technology Limited. The BioSelf vision is driven by his experience of the last decade that ‘modern people can’t easily meditate’, as the skills required are too hard and few have the time to learn them. His solution to this critical problem is Sensate Pebble - a world-first wearable device which tracks and decelerates stress in real-time. Our panelists engaged us into very lively discussion, educated and inspired us. Moderator of the panel was our CEO, Marija Butkovic. We were honoured that our partners and sponsors BioSelf Technology Limited have donated 1 Sensate Pebble as a prize giveaway on the night! 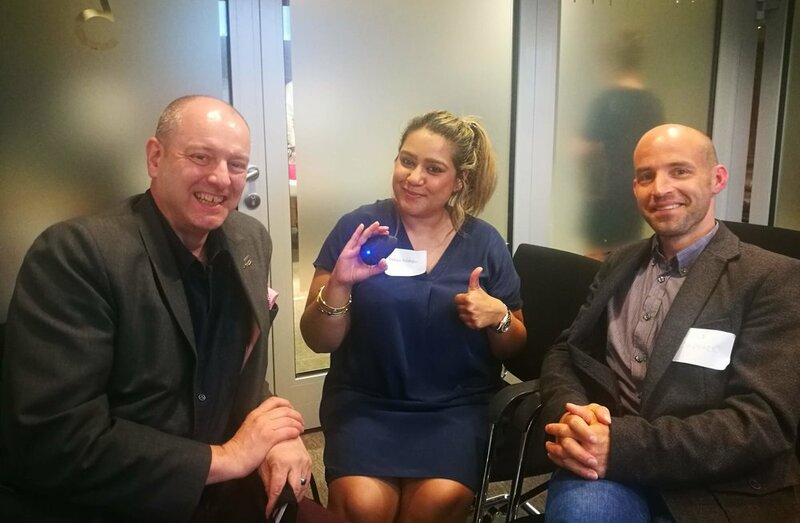 Lucky winner was Nadiya Siddique, one of our faithful WoW members and founder of Stealthy! Thank you so much Stefan, Jacob & Bioself team for your generosity and for sponsoring this event! We have a special discount, £20 off, for the Woman of Wearables community. Use the code WOW179 when placing the order! Many thanks to our sponsors and partners Marks & Clerk for hosting us and for their support during this event! And last, but not least, big Thank you! goes to lovely Seetal Fatania, WoW supporter and member, for her help and support during the event, we couldn't have done it without her! If you would like to stay up to date with our future events and attend our upcoming meetups, then sign up to our newsletter or join our London meetup group. If you’re interested in speaking at or sponsoring our events and meetups, then get in touch via email at hello@womenofwearables.com. This blog was written by Marija Butkovic, Digital Marketing and PR strategist, founder and CEO of Women of Wearables and co-founder of Kisha Smart Umbrella. She regularly writes and speaks on topics of wearable tech, fashion tech, IoT, entrepreneurship and diversity. Visit marijabutkovic.co.uk or follow Marija on Twitter @MarijaButkovic @Women_Wearables @GetKisha.